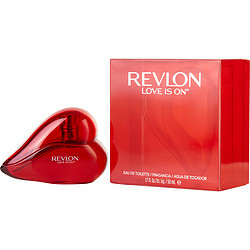 Spread the love when you wear Love Is On from Revlon. This tempting scent for women lets you wear your heart on your sleeve - or pulse points - with its scintillating medley of notes. Bracing hints of Italian lemon and spicy ginger give way to an intriguing composition of roses, red berries and cardamom to put you in the mood for love. This seductive scent is ideal for wearing with your little black dress on date night or anytime you want to feel beautifully feminine.